After 1854 the Oto and Missouri Indian village and agency were located near here. For many years the two tribes had been living along the lower portion of the Platte River, but when Nebraska became a territory they relinquished all claims to those lands. In exchange they received yearly cash payments, agricultural equipment and other goods in addition to a reservation of approximately 250 square miles around the village. According to Indian Agent Major A. L. Green the community in 1870 consisted of 40 earth lodges plus several bark houses and tipis. There was also a combination school and church and a two-story frame house for the agent. South of the village was a blacksmith shop, a steam-powered saw mill and grist mill and residences for the other agency employees. 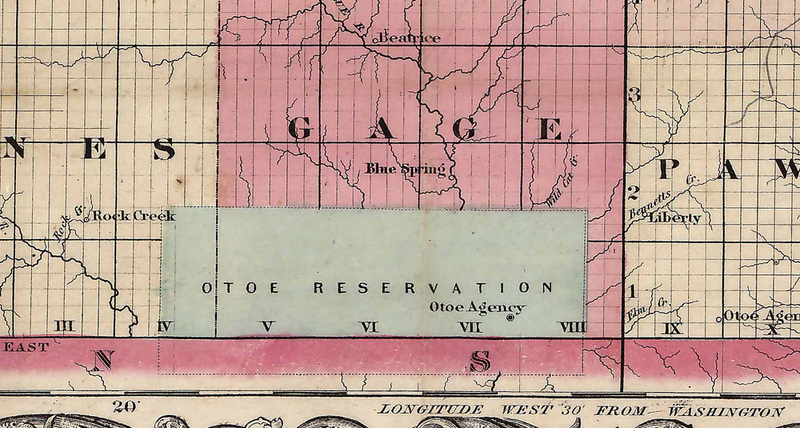 In the early 1870's the Oto and Missouri expressed a desire to move to Oklahoma. The reservation was sold, and by 1881 the two tribes had left Nebraska for their new home. After the Indians left, Francis M. Barnes opened a store near here to accommodate the settlers. The community of Barneston was named in his honor. “The Oto and Missouri Agency,” Explore Nebraska History, accessed April 19, 2019, https://mynehistory.com/items/show/230.